Desalting is the first separation process that takes place at the front end of a petroleum refinery (i.e., prior to atmospheric distillation; Figure 1.5). Its primary objective is to prevent corrosion and fouling of downstream lines and equipment by reducing the oil’s salt content significantly. Desalting is normally considered a part of the crude distillation unit since heat from some of the streams in the atmospheric distillation is used to heat the crude in the desalting process. The most common salts in crude oil are sodium, calcium and magnesium chlorides (NaCl ~ 70 to 80wt%, CaCl2 ~10wt%, and MgCl2 ~ 10 to 20wt%), which are in the form of crystals or ionized in the water present in the crude. If salt is not removed, the high temperatures present during crude oil refining could cause water hydrolysis, which in turn allows the formation of hydrochloric acid (HCl), provoking serious corrosion problems in the equipment. Part of the salt that has not been removed can also cause fouling problems in pipes, heat transfer equipment, and furnaces. Deactivation of catalysts (e.g., the zeolite-type catalysts used in fluid catalytic cracking) may be enhanced by the metals in salts, particularly sodium. Typically, the maximum salt content allowed in the feed to crude distillation units is 50PTB (pounds of salt per thousand barrels of crude oil). Desalting consists of washing the crude oil with water and caustic (NaOH) so that the salts can be diluted in water and washed from the organic phase. Figure 1.5. Desalting and atmospheric and vacuum distillations of crude oil. Some of the mixed water forms an emulsion that must be demulsified to separate water from oil. Emulsifiers are present in the form of clay, metallic salts, and asphaltenes, whose contents are higher in heavy crude oils. By this means, dissolved salts are removed and acid chlorides (MgCl2 and CaCl2 ) are converted to a neutral chloride (NaCl), which prevents the formation of hydrochloric acid when residual chlorides enter the refinery. Some naphthenic acids are also converted to their respective carboxylate salts and removed as part of the aqueous effluent. The carboxylate salts produced during the conversion of naphthenic acids are surface active and can form stable solutions. This process is controlled by coalescing and decanting the suspended water droplets, which possess an electric charge, under the influence of an electric field (-700 to 1000V/cm). This electric field destabilizes the electric array in the droplets. Desalting can be carried out in a single stage (dehydration efficiency of -95%) or in two stages (dehydration efficiency of -99%). The dehydration efficiency can be compared with the desalting efficiency, as most of the salt passes from the organic phase into the water phase if mixing is good. The decision as to whether to use a single or a double stage depends on the requirements of the refinery. Typical desalters have two electrodes which generate an electric field within the emulsion, causing the droplets to vibrate, migrate, and collide with each other and coalesce. Voltage (16,000 to 30,000V ac) is what makes coalescence possible, so that the larger drops settle under the effect of gravity. Electric current does not participate in this process. • Preheating of water and oil and mixing in a 1:20 ratio. • Addition of a demulsifier substance (-0.005 to 0.01lb/bbl). • Mixing in a valve (5 to 20psi pressure drop). The better the mixing, the higher the salt removal, so that the salt content in oil is washed with the water and a water-oil emulsion is formed. • Entrance of the emulsion into the desalter, where an intense electric field is present. The desalter operates at temperatures between 95 and 150°C. The oil leaves the desalter. Apart from removing salt, electrostatic desalting also eliminates water and suspended solids in crude oil. 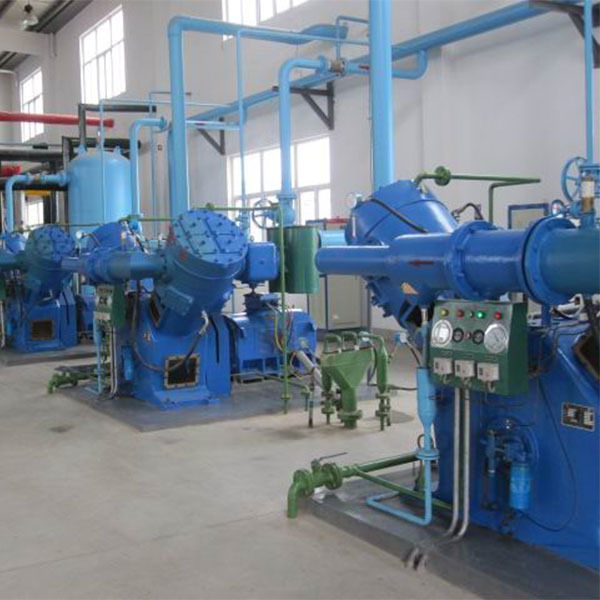 Water removal is important to reduce pumping costs and to avoid vaporization when the water is passing through the preheater train (i.e., the water heat of vaporization reduces the crude preheater capacity). Otherwise, due to the high pressure, it causes disturbances and vibrations and eventually plant shutdown. Elimination of suspended solids is necessary to avoid their going all the way through the plant to be expelled with the flue gas. This causes flue gas opacity that does not meet environmental requirements, resulting in mandatory additional treatment prior to being expelled. 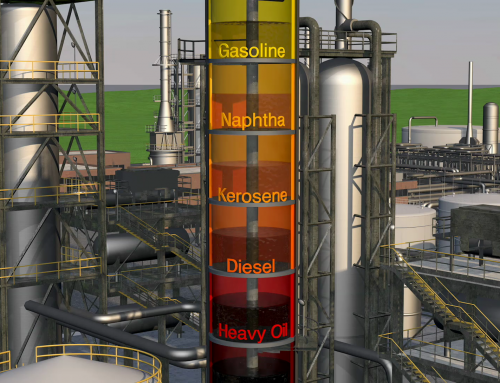 The main separation step in any crude oil refinery is atmospheric or primary distillation. Atmospheric distillation fractionates the crude oil into various distillates, fractions, or cuts of hydrocarbon compounds based on molecular size and boiling)point range [e.g., light ends, propane, butanes, straight ) run naphthas (light and heavy), kerosene, straight-run gas oils (light and heavy), and atmospheric residue] (Figure 1.5). The term atmospheric distillation is used because the unit operates slightly above atmospheric pressure. Separation is carried out in a large tower, which contains a number of trays where hydrocarbon gases and liquids interact. The heated desalted crude enters the frac-tionation tower in a lower section called the flash zone. 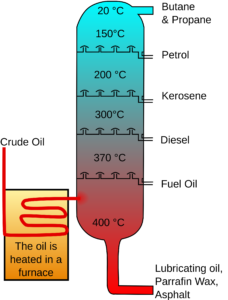 The unvaporized portion of the crude oil leaves the bottom of the tower via a steam stripper section, while the distillate vapors move up the tower countercurrent to a cooler liquid reflux stream. The cooling and condensing of the distillation tower overhead is provided partially by exchanging heat with the incoming crude oil and partially by either an air- or a water-cooled condenser. Additional heat is removed from the distillation column by a pump-around system, which is simply an internal condenser that ensures a continued reflux stream flow. The overhead distillate fraction from the distillation column is naphtha, which is allowed to leave the top of the tower to be condensed and collected in the overhead drum. A portion of this stream is returned as reflux, while the rest is delivered to the light-end processes for stabilizing and further distillation. The other fractions removed from the side of the distillation column [i.e., from selected trays (draw-off trays)] at various points between the column top and bottom are jet fuel, kerosene, light gas oil, and heavy gas oil, which are steam stripped, cooled by exchanging heat with the incoming crude oil, and sent to other treatment areas and/or to storage. The heavier material (i.e., atmospheric residue oil) is withdrawn from the bottom of the tower. Each stream is converted further by changing the size and structure of the molecules through cracking, reforming, and other conversion processes. The converted products are then subjected to various treatment and separation processes to remove undesirable constituents or impurities (e.g., sulfur, nitrogen) and to improve product quality (e.g., octane number, cetane number). Atmospheric distillation is a crucial step, since it routes the molecules to the appropriate conversion units in the refinery. The cut point of the atmospheric residue depends on the prevailing fuel specifications and crude slate used. The atmospheric residue leaves the bottom of the unit and is processed further in the vacuum distillation unit. It is important not to subject crude oil to temperatures above 370 to 380°C because the high-molecular-weight components will undergo thermal cracking and form coke. The coke, by operating the distillation units at a high temperature, would result in plugging the tubes in the furnace that heats the crude oil fed to the distillation column. Plugging would also occur in the piping from the furnace to the distillation column as well as in the column itself. The main objective of a vacuum or secondary distillation unit is to recover additional distillates from atmospheric residue (long residue). The atmospheric residue is distilled to provide the heavy distillate streams used to produce lube oil or as feed to conversion units. The primary advantage of vacuum distillation is that it allows for distilling heavier materials at lower temperatures than those that would be required at atmospheric pressure, thus avoiding thermal cracking of the components. 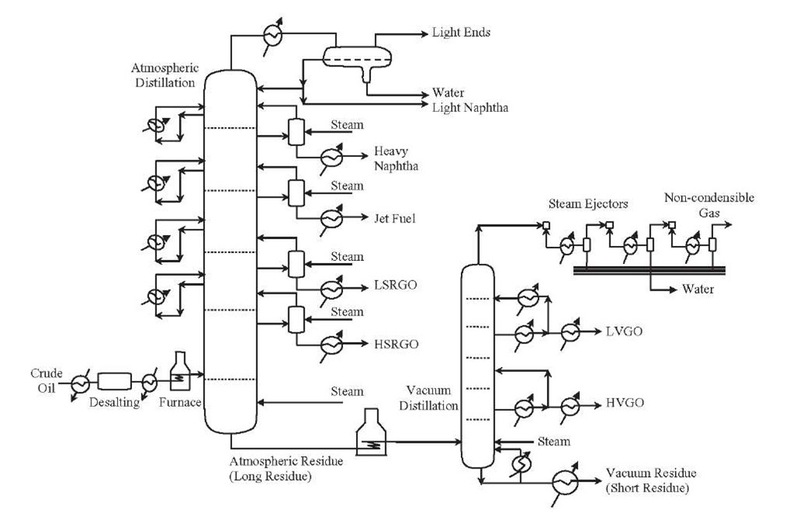 Vacuum distillation is often integrated with the atmospheric distillation as far as heat transfer is concerned. This unit’s integration is called combined distillation. Generally, the atmospheric residue is received hot from the atmospheric distillation and is sent to the fired heater of the vacuum unit. The vacuum distillation unit is operated at a slight vacuum, which is most often achieved by using multiple stages of steam jet ejectors (absolute pressures as low as 10 to 40 mmHg). This allows the hydrocarbons to be separated at lower temperatures and prevents undesirable chemical reactions. Atmospheric residue is separated into light vacuum gas oil, heavy vacuum gas oil, and vacuum residue (Figure 1.5). The vacuum gas oils are sent to the catalytic cracking unit for further processing, while the vacuum residue (short residue) can be used as feedstock for further upgrading (i.e., coking, hydro-cracking, etc.) or as a fuel component. Vacuum distillation follows very much the same pattern as that of atmospheric distillation. One difference is that neither the vacuum residue that leaves the bottom of the tower nor the sidestreams are steam stripped. The technology of vacuum distillation has developed considerably in recent decades. The main objectives have been to maximize the recovery of valuable distillates and to reduce the energy consumption of the units. The vacuum distillation column internals must provide good vapor-liquid contact while maintaining a very low pressure increase from the top of the column to the bottom. Therefore, the vacuum column uses distillation trays only where withdrawing products from the side of the column. Most of the column uses packing material for the vapor-liquid contact because such a packing has a lower pressure drop than that of distillation trays. This packing material can be either structured sheet metal or randomly dumped packing such as Raschig rings. Since distillation separates petroleum products into groups only by their boiling-point ranges, impurities such as sulfur and nitrogen may remain. 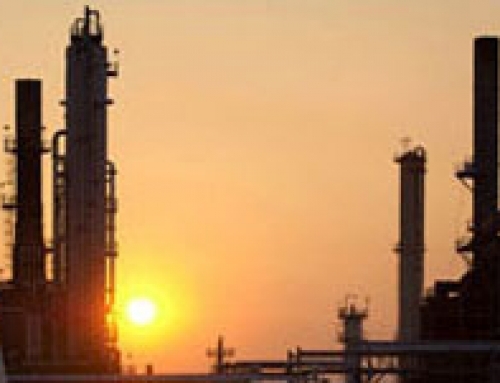 Solvent refining processes, including solvent extraction and solvent dewaxing, usually remove these undesirables at intermediate refining stages or just before sending the product to storage. Solvent extraction processes are employed primarily for the removal by dissolution or precipitation of constituents that would have an adverse effect on the performance of the product in use. An important application is the removal of heavy aromatic compounds from lubricating oils. Removal improves the viscosity-temperature relationship of the product, extending the temperature range over which satisfactory lubrication is obtained. The usual solvents for the extraction of lubricating oil are phenol, furfural, and cresylic acid. Solvents used less frequently are liquid sulfur dioxide, nitrobenzene, and 2,2′-dichloroethyl ether. Solvent dewaxing is used to remove wax from either distillate or residua at any stage in the refining process. The general steps of solvent dewaxing processes are (1) mixing the feedstock with a solvent, (2) precipitating the wax from the mixture by chilling, and (3) recovering the solvent from the wax and dewaxed oil for recycling by distillation and steam stripping. Usually, two solvents are used: toluene to dissolve the oil and maintain fluidity at low temperatures, and methyl ethyl ketone (MEK) to dissolve a little wax at low temperatures and act as a wax- precipitating agent. 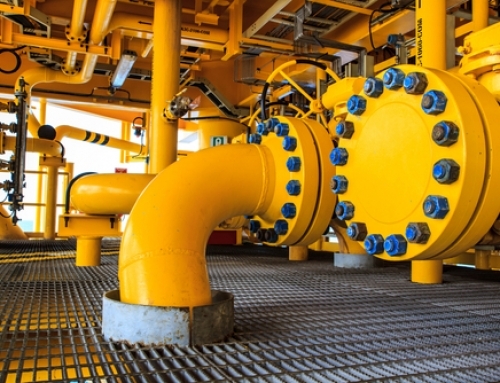 Other solvents that are sometimes used are benzene, methyl isobutyl ketone, propane, petroleum naphtha, ethylene dichloride, methylene chloride, and sulfur dioxide. In addition, a catalytic process is used as an alternative to solvent dewaxing. The separation of vacuum residue into fractions by distillation without decomposition is not practiced commercially since it is very difficult and expensive. Solvent deasphalting (SDA), a nondestructive liquid-liquid extraction process, is preferred to achieve this goal, whereby the last of the molecules that can be refined to valuable products are extracted from the vacuum residue. SDA is a molecular-weight-based separation process member of the family of carbon rejection technologies, which has been used for more than 50 years to separate heavy fractions of crude oil beyond the range of economical commercial distillation. Use of SDA has been reported for production of lube oil feedstocks from vacuum residue using propane as a solvent, for preparation of feedstocks for catalytic cracking, hydrocracking, and hydrodesulfurization units, as well as for the production of specialty asphalts. In most of these conversion units the performance of the catalyst is greatly affected by the presence of heavy metals and the high Conradson carbon content of the residue feed, which are concentrated in the asphaltene molecules, so that removing asphaltenes also eliminates these impurities. Deasphalting is an extraction process that separates the residue into several fractions on the basis of relative solubility in a solvent (normally, a light hydrocarbon such as propane, butane, pentane, or hexane). The yield of deasphalted oil increased with increases in the molecular weight of the solvent, but its quality decreases. SDA produces a low-contaminant deasphalted oil (DAO) rich in paraffinic-type molecules and a pitch product rich in aromatic compounds and asphaltenes containing, of course, the majority of the feed impurities. The DAO produced has a lower carbon residue and metals content than that of the untreated oil, but SDA is not as effective in lowering the sulfur or nitrogen content in DAO. • For environmental reasons. If H2S and CO2 are not removed, they combine with the atmosphere to form very dilute sulfuric acid, and carbonic acid, respectively, which are considered injurious to personal health. • To purify gas streams for further use in a process. Acid gases cause excessive corrosion to metals. 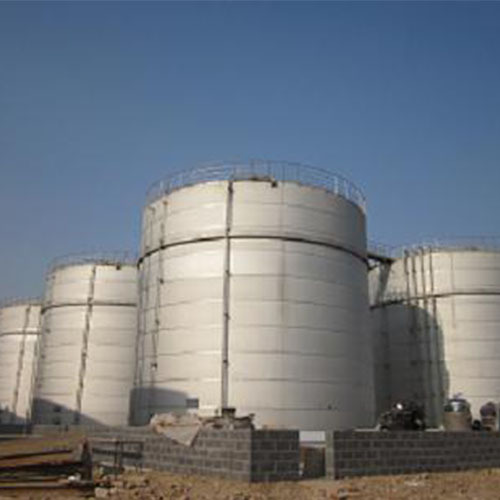 Gas sweetening is commonly carried out using an amine gas-treating process which uses aqueous solutions of various alkanolamines: MEA, monoethanol-amine; DEA, diethanolamine; MDEA, methyldiethanolamine; DIPA, diiso-propylamine; DGA, aminoethoxyethanol or diglycolamine—MEA, DEA, and MDEA being the most commonly used amines. Among them, MEA has become the preferred amine commercially, due to its high acid gas absorbency. Apart from amine gas treating, hot potassium carbonate (Benfield) is another process that can be used for acid gas sweetening. There are also other alternatives, based on physical solvent processes (e.g., Sulfinol, Selexol, Propylene Carbonate, Rectisol) and dry adsorbent processes (e.g., molecular sieve, activated charcoal, iron sponge, zinc oxide). • Passing the acid gas stream through an absorber unit (contactor), in which the downflowing amine solution absorbs H-S and CO- from the upflowing gas to produce an H-S-free gas called sweetened gas and an amine solution rich in absorbed acid gases. • Sending the rich amine to a regenerator, which consists of a stripper with a reboiler, to produce regenerated or lean amine. • Cooling and recycling the regenerated amine for reuse in the absorber. • Sending the H2S-rich stripped gas stream to a Claus process to convert it into elemental sulfur, which is produced by burning H-S with a controlled airstream. This gas stream can also be sent to a WSA process to recover sulfur as concentrated sulfuric acid. • Washing the sweetened gas with water to remove any entrained amine before leaving the top of the contactor. LPG, naphthas, jet fuel, and kerosene have a sulfur content, predominately in the form of mercaptans, that can be removed by converting them to liquid hydrocarbon disulfides. The most common process used to achieve this target is Merox (mercaptan oxidation), licensed by the UOP. This process requires an alkaline environment provided by either a strong base (commonly aqueous solution of sodium hydroxide) or a weak base (ammonia). Although the Merox process is more economical than catalytic hydrodesulphurization, some refiners still select it to remove sulfur compounds from debutanized naphtha. Sour water is typically treated by a stripping unit with steam by means of which H2S and NH3 are released at the top of the stripping tower. The H2S – free water is treated in a biological wastewater treatment plant where the remaining ammonia is nitrified and then denitrified. Due to the physics and chemistry of H2 S treatment systems, removal amounts of ammonia, selenium, phenol, salts, and other constituents are lower than that of hydrogen sulfide. In a typical stripping unit, the sour water is fed on to the top tray of the tower while steam is introduced below the bottom tray, which lends itself to tray-by-tray mass and heat transfer. The sour water stripping unit is almost always located in the process area of the refinery and can be a single tower with no reflux or a single trayed tower with an overhead reflux stream. Other processes for treatment of sour water are: caustic/acid neutralization, caustic oxidization, and oil removal by settling.